A spectacular presentation of a new project, based on big questions. Starting with this seminal experiment, PLOT, the former group of Bjarke Ingels and Julien De Smedt, uses video as a tool to explain and spread its ideas to a wide audience. In "Superharbour" it is clear that the main aim is to let spectators visualize the data of a project that has yet to see its inception. Each element of the video is adapted to shorten the distance between experts and global citizens by means of shaping a pedagogical style towards better communication and promoting purposes. Through this video PLOT combines images, spoken dialogues, numbers and graphic schemes within the general narration in order to present this planning research proposal for the Fehmern Belt area for the occasion of the 2004 Architecture Biennale in Venice. An initial three-dimensional reconstruction of a spectacular and futuristic Superharbour is followed by a meticulous and clear explanation of the project and of its benefits and effects on the global economy. Complex data and statistics are simplified and made understandable. 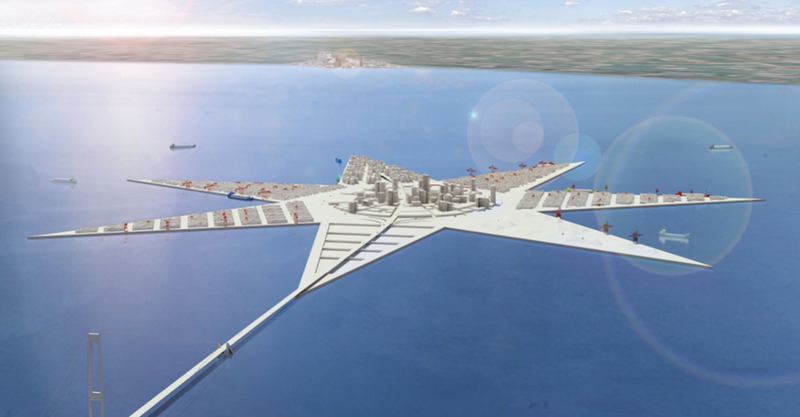 The Danish architects propose an articulate project to consolidate all Danish harbour traffic into a star shaped Superharbour. Considered a new gate to the Baltic Sea markets, it is strategically located on the yet-to-be-built Fehmern bridge between Denmark and Germany, at the optimum intersection of north-south traffic between Scandinavia and Europe. Actually this imagined new industrial growth zone would allow "the cities to consolidate their growth where people want to live, rather than scattering ever more suburban developments on the urban outskirts". PLOT, by means of the video, seems to invite architects to use their "collective creativity and competence not on small decorative details – but on big questions".